This narrated video demonstrates the formation of lacrimal sac and nasal mucosal flaps in endo DCR and reviews the different instruments that can be used for these steps of endo DCR and the way that the flaps should sit after they have been formed and opened out. Forming anterior and posterior lacrimal sac flaps can be one of the more challenging stages of endoscopic DCR. The lacrimal sac is tented up with a Bowman probe. The exquisitely sharp disposable cataract keratome is being used to make a longitudinal, vertical incision in the lacrimal sac. A hooked micro sickle knife is being used to make the horizontal transverse cuts at the top and bottom of the anterior lacrimal sac flap. This can be an unsatisfactory step because they are frequently blunt and the lack of counter traction, can tear rather than cut the lacrimal sac. Straight Belucci microscissors are being used to make the transverse cuts at the top and bottom of the posterior lacrimal sac flap. Sometimes the lacrimal sac mucosa is thickened, perhaps from chronic inflammation or even occasional lymphoproliferative disease. In this case the microbite lusk forcep can be used to make the transverse incisions at the top and bottom of the posterior lacrimal sac flap. This throughbiting instrument is generally sharp and cuts well but does excise a bit of tissue, which may reduce the mucosal apposition at the top and bottom slightly. Depending on one’s endo DCR technique the raised and reflected nasal mucosal flap can be too large to neatly abut the end of the posterior lacrimal sac flap. It is being trimmed here with a microbite Lusk forcep. This nice instrument cuts well when the jaws are being closed whilst simultaneously pulling the flap towards you to create couter-traction. The flaps should open freely, without a tension pulling them forward or closed again, rather like opening an old book with a very worn spine. The anterior lacrimal sac is reflected anteriorly to rest against the lateral nasal wall but does not adjoin a nasal mucosa flap end to end like in external DCR. The posterior flap is reflected backwards and can be positioned to abut the end of the raised and later trimmed nasal mucosa so as to create a continuous mucosal lining. 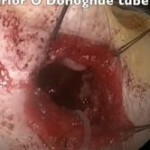 This may reduce the risk of subsequent fibrosis and osteal closure. 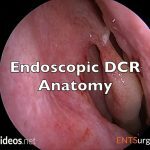 Most endoscopic DCR surgeons do not suture the flaps and while this can be done studies that have found similar recurrence rates for endo and external DCR report endo DCR without flap suturing.